ABC Nightline’s piece on the 9-11 Truth Movement qualifies as nothing short of journalistic fraud. Instead of presenting an objective look at the surprisingly large numbers of people who are questioning the government’s official conspiracy theory involving 19 Arabs, Bury’s piece was clearly intended to equate in viewers’ minds those in the 9-11 Truth Movement” with gun-wielding crazies like the recent “Pentagon shooter” John Patrick Bedell. While this movement includes a wide variety people including thousands of architects, engineers, firefighters, academicians and scientists, Nightline seemed intent on creating an oversimplified caricature of what it disparagingly called a “viral community of true believers,” that is, people who are crazy enough to suspect the government might be hiding something when there’s no evidence to support that idea. There’s actually a lot of evidence, but TV shows like Nightline are not interested in looking at it, much less refuting it. The Architects and Engineers for 9-11 Truth were featured as keynote speakers at the same conference that you attended and now host over 1,000 A/E petition signers—all demanding a new investigation into the destruction of the three World Trade Center skyscrapers on 9-11. Why did you not ask us what evidence we might have to support our call for a re-investigation? We understand that you were even re-directed by no less than three of your interviewees to speak with us. Lee Hamilton told Nightline, “When they bring these theories of what happened forward, the appropriate question is, ‘What evidence do you have of that?’ And if they have evidence, then let’s examine it in the court of public opinion.” We may be on the same page with Lee Hamilton after all. This is exactly what groups like ours want to see happen. For instance, why did World Trade Center Building 7, which was never hit by an airplane, collapse suddenly, smoothly, straight down into its own footprints at free-fall acceleration? This is a question for an enterprising, seasoned journalist like Chris Bury of Nightline to pursue—especially since there is an abundant evidence of the incendiary “thermite” in the molten iron found in the rubble of all three WTC skyscrapers. And since the explosive composite “nano-thermite” was found in all of the pulverized concrete that was laid like a blanket throughout lower Manhattan. • Rapid onset of collapse of all three WTC skyscrapers. 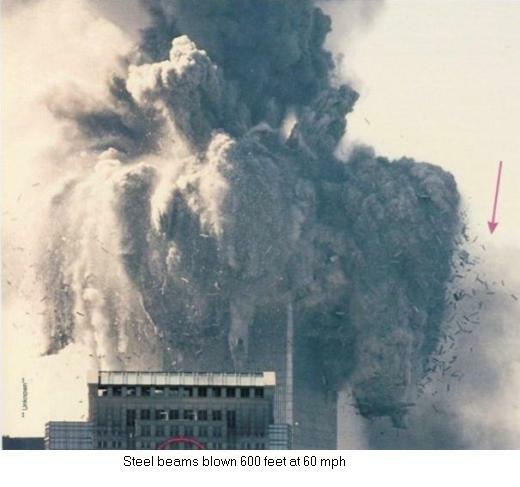 • WTC 7 collapsed nearly into its own footprint with the steel skeleton almost completely broken up. The Twin Towers on the other hand were extremely explosive—hurling 9-ton steel sections laterally several hundred feet. • Several tons of molten metal found at the base of the buildings by credible witnesses. 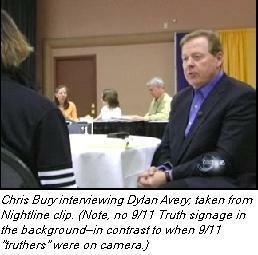 The details can be found at www.AE911Truth.org and are available to anyone who wants to look at them, yet Nightline representatives chose to devote their attention to mischaracterizing members of the 9-11 Truth Movement instead of actually confronting the evidence. What is their agenda? This entry was posted in 911 by Shawn Hamilton. Bookmark the permalink.